This Art Nouveau building, built from 1905 to 1911, is proof of unprecedented artistic and craft skills and quality. The café, the French and the Pilsner restaurants, the American bar, the Lord Mayor’s Salon and the Smetana Hall are all examples of perfectly executed Art Nouveau interiors, decorated by leading artists and sculptors such as Alfons Mucha, Jan Preisler, Ladislav Šaloun, and others. Lovers of Art Nouveau can take a guided tour of the whole building. Admission fees in detail, reservations, guided tours dates here or contact the information centre. The Municipal House stands at the site of the royal residence called King's Court. It was a building from the time of Wenceslas IV around 1383, which served as an interim dwelling of King Zikmund; Ladislav Pohrobek died here and the coronation procession of Jiří z Poděbrad started its journey here. However, after 1490 Jagellons moved their seat to Buda and pledged the King’s Court in 1515. In 1631 Cardinal Arnošt Vojtěch Harrach redeemed it in order to establish the Archbishop Seminary there (from 1636). After the abolishment of the Jesuit order the seminar was moved to Klementinum and the army obtained the building. Králodvorská barracks remained here until 1869 and consequently the military cadet school was here. The King's Court was demolished in 1902 - 1903. The intention of the Prague City Hall to build a representative building and the desire of the most important Czech Burgher Association Měšťanská beseda to expand its facilities with the costs being paid by the City were at the birth of a new building, which would represent the capital city of the Kingdom and support the Czech social life. In 1902 the City Council approved the construction and in 1903 it approved the purchase of land next to the Powder Gate. In 1904 the project was approved and construction works began in 1905. The building was built from 1905 to 1911 according to the project of architect Antonín Balšánek and Osvald Polívka as a centre of the Czech cultural life and as a counter balance of the nearby German House and Casino and the German promenade at Na Příkopě Street. The construction started on 9 August 1905 by builders František Schlaffer and Josef Šebek. In November 1911 an exhibition of three leading Czech art clubs - Unity of Fine Arts, Fine Artists Association Mánes and the Group of Artists was opened here. The house was finally approved on 22 November 1912. It became the centre of social life and a place of important historical events, which is evidenced by the bronze plaque by Ladislav Šaloun that is located outside next to the Powder Gate. On 6 January 1918 the so-called Three Kings Declaration was adopted here calling for the creation of independent Czechoslovakia. In April, the National Oath was taken in the Smetana Hall and in June the Czechoslovak National Committee, the germ of the future parliament and government was established in the Grégr hall. On the balcony in front of the Mayor Hall the Czechoslovak Republic was proclaimed on 28 October 1918. At the same time the first law of the new republic was issued here and from 28 October to 13 November the first National Committee assembled here as the first parliament and the state government. One of the two plates in the Czech club comments on these events saying, "...Here the word of Comenius comes true: your government will return to you, Czech people." The period of the 1920s and 1930s was the most famous era of the Prague Representation House as was the name of the building at that time. Balls, festivals, professional conferences, exhibitions by leading artists and associations were held here. In November 1989, in the Smetana Hall actors joined the strike of students and the first meeting between Václav Havel and the former Prime Minister Ladislav Adamec was held here. The Municipal House stands on a plot of about 14,000 square meters, the built-up area is 4,214 m2 and the total building volume is approximately 14,000 cubic meters. There are about 1,240 rooms in the building. 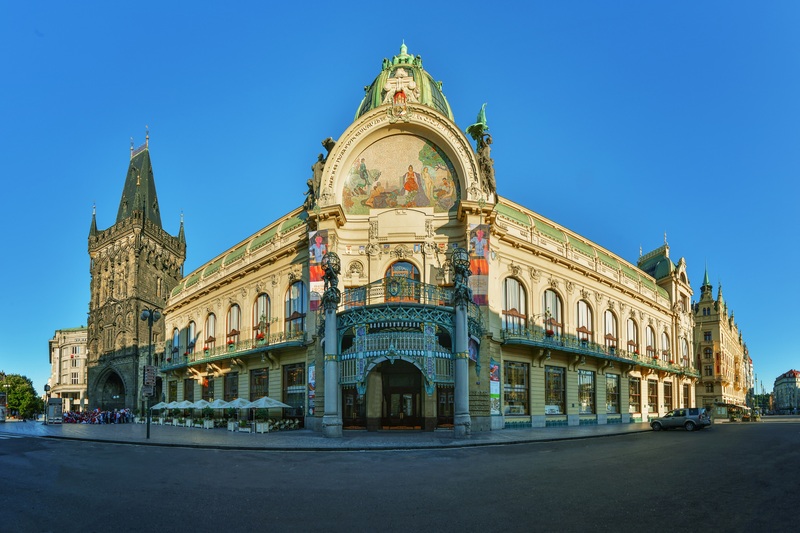 Externally, the Municipal House is a historic relic of 19th century, the mixture of pseudo-renaissance and pseudo-Baroque, but generally it is considered an important example of Prague Art Nouveau. The whole building is a testament to the skills and unprecedented quality of art and craft; the building was also very modern in terms of the used state of-the-art technological facilities in Central Europe at that time unprecedented. There were 28 electrical and hydraulic lifts, air-conditioning system with remote control, pneumatic post, central vacuum cleaner, modern telephone exchange, ice factory, refrigerator and the most modern kitchen there. There was also one of the largest electro-pneumatic organ in the whole monarchy there. For the first time linoleum, then a cry of progress, as well as brass and other materials were used here in a great extent. All the known arts and crafts are represented in the interior; these products show a sense of beauty and utility: stained glass, clocks, wooden and ceramic tiles, natural and artificial marbles, free furniture sets, mirrors, drapery, heating and ventilation covers and namely lighting sets made of non-ferrous metals and glass (mostly designed by František Anýž and implemented by Křižík company). The Municipal House was an expression of the confidence of the Czech nation and was conceived as its celebration. Also the spectacular decoration and politically motivated names of halls corresponded to that. 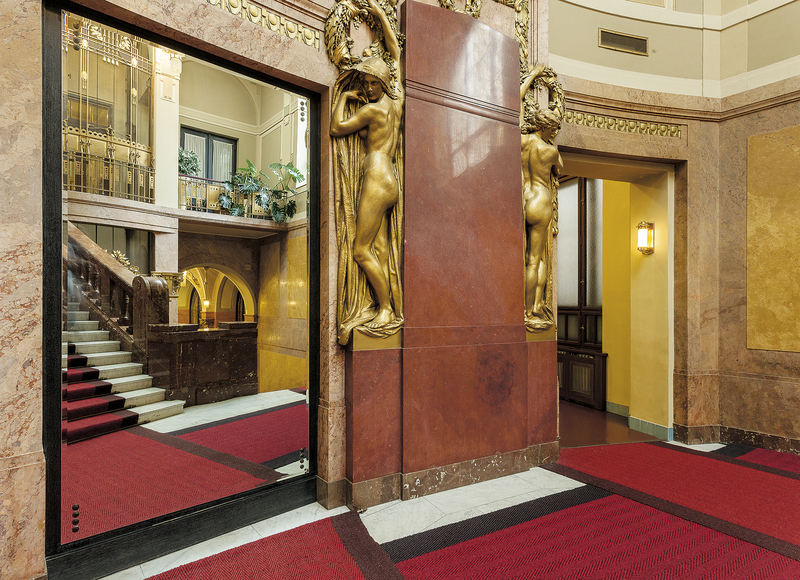 Above the huge main entrance decorated in the Art Nouveau style there is a lunette mosaic by Karel Špillar representing the apotheosis of Prague. On the ledge above it there is an inscription, the quote by Svatopluk Čech: "Hail to you Prague! Resist time and anger in the same way you have resisted all storms!" and the sign of the City of Prague. On the sides there is a sculpture called the Nation's Humiliation and the Revival of the Nation by Ladislav Šaloun. Below the mosaic there is a balcony on awning columns accessible from the Mayor's parlour; columns are finished with the bronze figures of torch bearers with electric lights by Karel Novák. Between the windows of the first floor there are stucco pillars with embossed medallions on which the sculptors Josef Pekárek, Gustav Zoula, E. Pickardt and Antonín Štrunc depicted the types of Czech folk costumes. On the corner at the Powder Tower there is a statue of its builder Matěj Rejsek by Čeněk Vosmík, on the attic there is a sculpture called the Spirit of history by František Rous, and at the level of the first floor there is a corner connected with the covered corridor with the Powder Tower. The corner of the right wing is fitted with semifigures by Antonín Štrunc - allegory of Literature, Construction, Statuary and Painting. The Large Gable opposite the Powder Tower Street is decorated with semifigures Seeder (Rozsévač) and Reaper (Žnečka) by Antonín Mára, on the side Façade on the first floor the Piper and Rusalka by František Úprka and Music and Drama by Josef Mařatka above the main cornice. The entrance vestibule with the vaulted dome is decorated with figures of Fauna and Flora by Bohumil Kafka. To the left of the lobby there is the entrance to the café, the walls of which are lined with mahogany wood. Opposite the entrance there is the stage and niche with a fountain by Osvald Polívka with the Nymphs statue by Josef Pekárek. The original air conditioning has been maintained here. To the right of the lobby there is a French restaurant, designed by Osvald Polívka with preserved wall painting by Josef Wenig Prague welcoming its guests and Hop-growing and Wine-growing depicted as a boy and a girl. The arc in the front part of the room decorated with signs and brass clock with glass lens leads to the lounge (the stage). Here the original wallpaper and painting of Hradčany and the New World by A. Zahela have been preserved. In the basement below the café there is a wine bar (322 m2), a barrel vaulted space with artistic ceramic tiles; over the entrance to the bar there is a ceramic relief of monkeys around a barrel. Windows (stained glass) bear motifs of vine leaves and grapes. Winehouse is not normally open; it is only available for rent. Under the lobby there is the American bar (73 m2) with black ceramic tiles; Mikoláš Aleš participated in the decorations with his collections of pictures embedded in the walls and paintings in niches (Farmer's wife with geese, Beater with a hare, A boy with a pig, Shrove Tuesday, Village wake in a pub, Up on horses and Passing of a lord to the inn).The paintings are copies, a part is from 1921 by A. Naumann, some are from later period. The marble bar has been made recently (in the 1990s) according to the original. The dome is decorated with so called golden rain. Under the French restaurant there is the Pilsen pub - a vaulted space decorated with twelve ceramic signs of Czech and Moravian towns and ceramic reliefs. At the entrance to the bar you can see the statue called Village Guy (Šohaj) and Girl by Jakub Obrovský and the Czech harvest mosaic by the same author. Windows (stained glass) with motifs of spikes and hops are original. The furniture was produced in the 1930s. In the mezzanine there is a so called men's wing - billiard and card rooms (originally women only had access to the card desks) and the central cloakroom. The mayor and presidential lift in front of the central cloakroom designed by O. Polívka and J. Prokopec are uniquely preserved and have been put into operation during the last reconstruction. It is only used for VIP visitors. 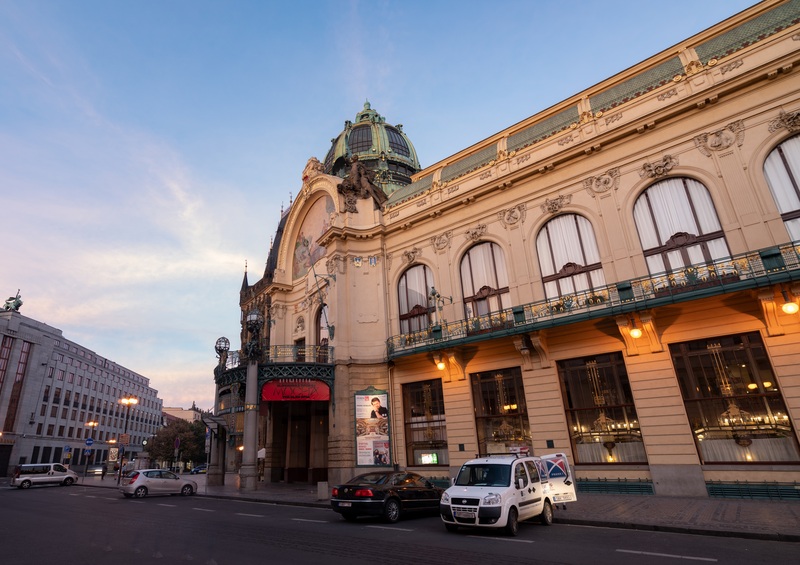 Smetana Hall (897 m2) is the central area of the first floor and of the entire Municipal House and it was designed by the architect Antonín Balšánek. Figural paintings on the ceiling were made by František Ženíšek and the stucco decoration is by Karel Novák. On the sides the proscenium arch is decorated with statues of Slavonic Dances and Vyšehrad by Ladislav Šaloun, portrait medallions of composers by Antonín Štrunc, Antonín Mára and Karel Novák (on the left František Škroup, Vilém Blodek, on the right Karel Bendl, Zdeněk Fibich, above the main entrance Jan z Holešova, Bohuslav z Čechtic, Kryštof Harant z Polžic and Václav Jan Tomášek) are embedded in balconies. Balcony niches with motifs of Music, Dance, Poetry and Drama were painted by Karel Špillar. The original facilities include mirrors, coloured stained glass on the ceiling and Art Nouveau fabrics; after the latest reconstruction the chairs were made in Italy as free replica of the original seats. The organ is decorated with a medallion of Bedřich Smetana by František Hergesel, it has 4 manuals and 89 registers. It was reconstructed by a German company. 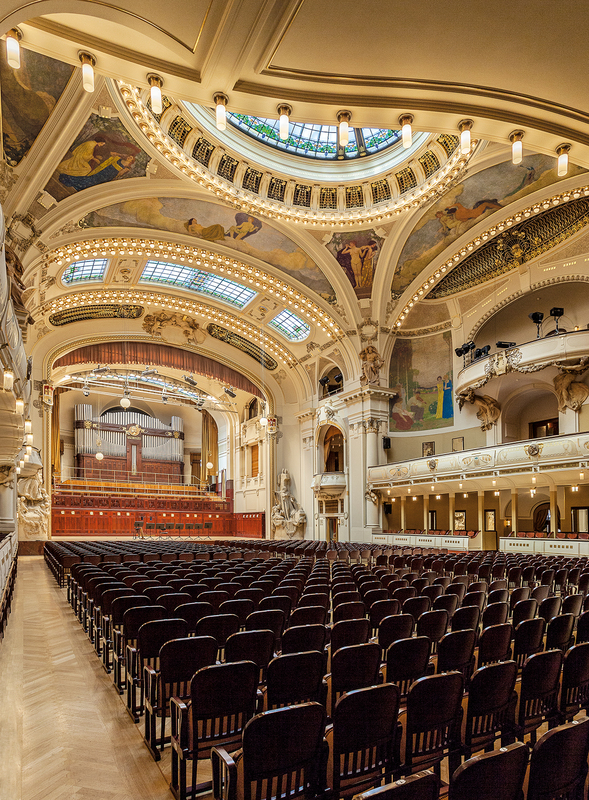 Initially, especially the Czech Philharmonics played in the Smetana Hall and since 1942 the hall has been the main hall of the Prague Symphony Orchestra FOK, which has been here till today. The Smetana Hall has been a regular point of the most important concerts of the Prague Spring since its inception in 1946. The capacity at the concert arrangement is 1259. Other rooms on the first floor were designed by Osvald Polívka. These are: The conducting lounge – former preparation room for the confectionery, Confectionery (108 m2) with stuccos by Karel Novák and the picture View of the town of Tábor by Václav Jansa. Slovácký lounge (54 m2) draws on themes from folk art: beads, ornaments, embroidery. The unique aquarium was renewed during the last reconstruction. Božena Němcová Lounge (54 m2) has a functional ceramic fountain with the statue of Božena Němcová (only copies, the original was lost in the 1970). The Oriental Lounge (55 m2) is covered with wood; it has a textile wallpaper, colourful ornaments and coloured ceiling stucco. Behind there is a connecting corridor between the Municipal House and Powder Gate. The wall of the Powder Gate is incorporated into the interior. In Grégr Hall (180 m2) there is a bust of Julius Grégr by Emanuel Hallmann. Franišek Ženíšek painted the triptych called Life, Poetry and Death on the ceiling and on the walls opposite the window there is the triptych called Love song, War song and Burial Song. The low balcony served as a place of orchestra for dancing. 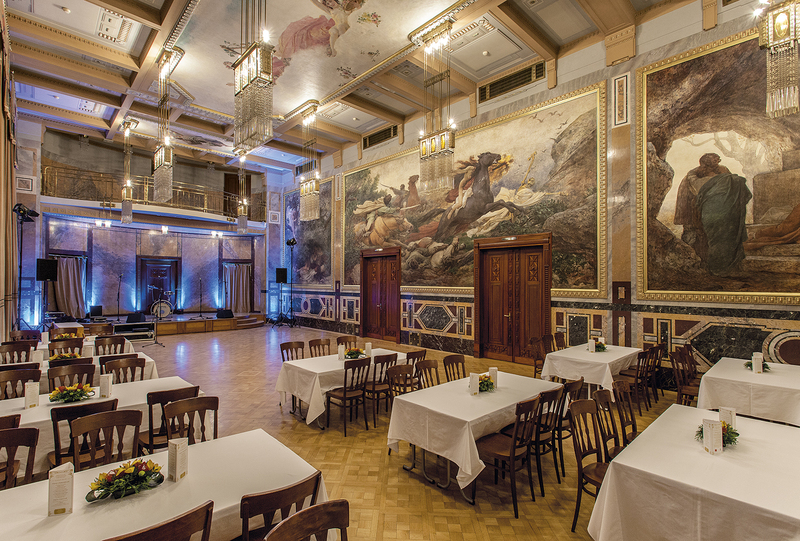 Palacký Hall (86 m2) has a painted decoration by Jan Preisler. On the walls he painted scenes from the legend and on the ceiling there is a symbolic image of a girl and a boy with flying birds. Between the windows there is the bust of František Palacký by Myslbek. The Mayor Hall (95 m2) with a circular floor plan has been decorated by Alfons Mucha. He had really wanted to get this contract, so he went down with his prices, which caused a sparking resentment among his colleagues. He painted the ceiling painting called Slavic unity and eight characters on the wall between the lunettes with themes Fight (Jan Žižka), Fidelity (Jan Amos Comenius), Strength (Vojtěch z Pernštejna), Vigilance (Chod), Rigidity (Jan Roháč z Dubé), Independence (Jiří z Poděbrad), Justice (Jan Hus) and Parent Wisdom (St. Ludmila). Three paintings are in the lunettes with inscriptions: Humiliated and tortured - you will be resurrected, my wide homeland; the son of Holy Mother of the nation please accept the love and enthusiasm and above the entrance there is Power for freedom and Love of loyalty. There are leather benches with backs designed by Mucha here (the Czech Crown motif and the Crying over the homeland disaster), followed by Mucha Decorative fabrics with coral and gold embroidery and tassels, colourful stained-glass on serpents and doves, and decorative brass grilles below the mirrors. From the hall you can access the balcony with the torchbearers. The Rieger Hall (83 m2) follows with a bust of František Ladislav Rieger by Myslbek, and paintings by Max Švabinský with figures of Czech greats on Spring of the Czech Literature (Čech, Zeyer, Němcová, Neruda and Vrchlický) and Spring of the Czech art (Smetana, Dvořák, Aleš, Myslbek, Mánes).There is a plaque with part of speech of František Ladislav Rieger in the address debate at the Assembly of the Czech Kingdom in 1867. In Sladkovský hall (208 m2) there is a bust of Karel Sladkovský by Ladislav Kofránek and landscape by Josef Ullmann. From the second floor you can enter balconies of the Smetana Hall. There are also exhibition halls here, namely the round area of Hollar Hall and two rectangular rooms with glass ceilings. During the last reconstruction the conductor’s suite was adapted for important visitors to Prague with a unique view of Prague Castle. In 1998 so called The Czech Club was additionally recovered; these premises were used by members and political parties during the World War I and it had early cubist unique equipment designed by Josef Chochol. In one room there are rare copies of the original furniture; due to its enormous price the original furniture is a museum exhibit. In the Czech Club Alois Rašín prepared the draft of the first Czechoslovak constitution. In 1999, the newfound and restored lunettes called Prague from Riegrovy Sady by Jaroslav Panuška, Prague from Podbaba by Roman Havelka, Prague from Libeň by Václav Jansa and Evening Twilight over Hradčany by Jindřich Tomec. Originally they were placed on the walls of Plzeň pub of the Municipal House and they were found in the cellar of the Troja castle. Cafe, restaurant, bar and brasserie are commonly accessible catering facilities; individual halls and lounges and other areas can be visited within the paid guided tour. The building was adapted several times. The last extensive reconstruction took place between 1994 and 1997 according to the design by the Architects Association for the reconstruction of the Municipal House (academic architect Martin Němec, ing. Arch. Alexandr Gjurić, ing. Arch. Karel Frankl) brought the building to its original state in 1912. Costs amounted to CZK 1.75 billion. Not only the building itself was restored, i.e. the cladding and for example also roofs (the building has a total of twelve roofs) but according to contemporary images also décor and artwork were restored or replaced. Damaged items, chandeliers, tapestries, curtains, furniture and technical equipment were restored or re-manufactured. On 1 January 2008 the secession billiard room was opened upstairs above the café overlooking the Powder Gate. In 1989 the Municipal House was declared National Monument.